Rockfield House has a particularly peaceful setting, looking over parkland sloping down to the River Dee valley, and the walled garden mimics the landscape, folding around a central stream like a half open book around its binding. 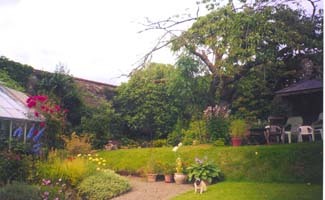 The walls of the acre square garden probably date back to the late 18th century and, in its present incarnation, has been gardened for two generations, with some happy alterations. Deep borders run around the walls, packed with pleasing and unusual plants and interesting plant combinations, like golden hop combined with the deep crimson flower of R‘William Lobb’. Vegetable gardens take advantage of the sunny side of the slope fitting seamlessly into the general scheme of things. At the highest point of the garden there are deep shrub borders and, in the corner which catches the western light, there is an evening garden with golden plants and shrubs - and plants like Salvia turkestana, which love their sunny dry vantage point. Just after N52 Kells to Ardee Rd crosses with turn left at sign for McKeevers Mill. After one mile turn right house is on left.